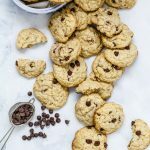 Oatmeal Chocolate Chip Cookies = Satisfying Indulgence + Guilt Free for Wholegrain Lovers. Preheat the fan assisted oven to 180 F, gas mark 4. Prepare the baking sheet, by lining with parchment paper. Whisk Butter and Sugar until just combined. Stir in Vanilla Extract, Egg and beat until fluffy and pale. Stir in Dry Ingredients - Plain Flour, Rolled Oats, Baking Soda, Salt and Chocolate Chips and combine them. Drop the Cookie Dough with rounded Teaspoon at least 2 inches apart, on the lined baking sheet. Bake for about 10 minutes to be precise until the edges are done. Repeat the process for the rest of the batch. Allow the baked oatmeal chocolate chip cookies to cool completely on the wire rack.